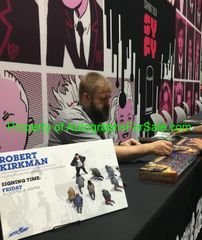 Rick Grimes The Walking Dead 15th Anniversary Box Set of 5 inch action figures autographed in blue marker on the plastic window by legendary creator Robert Kirkman. These sets were sold exclusively at 2018 San Diego Comic-Con. Obtained in person at very limited 2018 SDCC signing, with photo from the signing and certificate of authenticity from AutographsForSale.com. Outer packaging may have VERY MINOR handling flaws/wear. A written certificate of authenticity is provided with each autographed collectible, as required by law. All autographs are guaranteed authentic for LIFE. Autographed baseballs, golf balls and pucks come with free plastic holders.